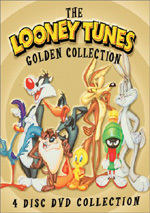 Looney Tunes Super Stars: Daffy Duck - Frustrated Fowl is a DVD of 15 new-to-DVD Daffy Duck cartoons. 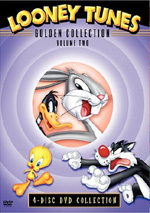 None of the cartoons are found on the Looney Tunes Golden Collections; along with Bugs Bunny: Hare Extraordinaire, these two DVDs are the successor to the Looney Tunes Golden Collection series. Both Daffy Duck and Donald Duck share a lot of similarities. Both are their respective studios’ second most famous characters, and both tend to be irascible and easy to anger. Both also tend to resent their better-known counterparts, though their “competitions” aren’t equal. No one doubts that Mickey Mouse is more famous than Donald, but the Duck is actually more popular; Mickey’s a famous face and voice but people tend to prefer to watch Donald. The same can’t be said for the “competition” between Daffy and Bugs Bunny. The latter holds the edge over the former in these ways: he’s more famous and more popular. But is he funnier? That’s up for debate, and the simultaneous release of two similar DVDs – one for Bugs and one for Daffy – gives us another chance to compare the two. For each short, I’ll offer the following information: the year in which it was produced and the director. I’ll also provide a quick synopsis of the cartoon plus my number grade for each one done on a scale of 1 to 10. Tick Tock Tuckered (1944, Robert Clampett): Porky and Daffy get in trouble when they arrive late to work, so they try their best to go to bed early and not oversleep again. “Tuckered” takes a simple premise and churns some laughs out of it. The interplay between Daffy and Porky adds points. 7/10. Nasty Quacks (1945, unspecified): A father adopts a duckling as a pet for his daughter. The duckling grows up to be manic nutcase Daffy; battles with the father ensue. Darned good battles, at that. In the prior short, Daffy and Porky seem to be almost interchangeable, but “Quacks” gives us the insane Duck we know and love. It’s about as crazy a short as I can imagine. 10/10. Daffy Dilly (1948, Chuck Jones): A mopey millionaire offers big bucks to anyone who can make him laugh before he dies, and Daffy attempts to collect the dough. After the brilliance of “Quacks”, “Dilly” almost inevitably disappoints. It comes across as a collection of semi-related sight gags without the same thematic coherence as its predecessor, so it doesn’t delight to the same degree. We still get some laughs, but they’re less frequent. 6/10. Wise Quackers (1949, Friz Freleng): After a failed flight south for the winter, Daffy deals with hunter Elmer; the Duck avoids deal when he agrees to be his foe’s slave. This one comes with some decidedly non-PC material, but that’s a minor component. Much of the movie offers the crazed humor that we expect from Daffy, and it amuses. 8/10. The Prize Pest (1951, Robert McKimson): Porky wins a prize from a radio game show: his own pet duck! Daffy then causes the expected havoc. The manic Duck and the mild-mannered Pig always created a nice contrast, and that factor works here. Throw in a little Dr. Jekyll and Mr. Hyde factor for a fun short. 7/10. Design for Leaving (1954, Robert McKimson): Daffy “futurizes” Elmer’s home – against Fudd’s wishes. It’s always amusing to see 50-year-old ideas of what a future technology will be, even though this short clearly goes for absurdity and laughs. The cartoon includes a nice mix of clever moments. 7/10. Stork Naked (1955, Friz Freleng): The stork plans to bring a new arrival to Daffy and Daphne Duck, but our boy doesn’t want it and tries to prevent this bundle of joy. “Naked” puts Daffy in an unusual position, as he’s usually the one who wreaks havoc for others ala the last few shorts. It’s not a totally unexpected change of pace, though; while Bugs was virtually always the one in control, Daffy could go either way. I prefer him as a more insane version of Bugs, honestly; Daffy works best as someone whose madness affects others. Still, “Naked” provides reasonable entertainment. 6/10. This Is a Life? (1955, Friz Freleng): Bugs gets a life retrospective on a TV show. Why is this short on a Daffy DVD? Yes, the Duck plays a part, but so do Elmer and Yosemite Sam. Most of the cartoon revolves around Bugs, and we often just see clips from old shorts. As always, we get some laughs, but this is still a fairly lazy piece. 4/10. Dime to Retire (1955, Robert McKimson): A tired Porky stays at Daffy’s super-cheap hotel – and soon learns how the operation makes its money. I must admit I miss the more daffy Daffy; the one here is slightly sadistic but not particularly nutty. The scenarios create clever gags, though. 6/10. Ducking the Devil (1957, Robert McKimson): With the Tasmanian Devil on the loose, Daffy fear that he’ll be eaten – but he becomes emboldened when he learns of the $5000 reward for the animal’s return. Daffy’s attempts to wrangle the wild beast provide decent humor, though again, the short does little to differentiate Daffy from Bugs; I easily could’ve seen the Bunny play the same part to the same effect. 6/10. People Are Bunny (1959, Robert McKimson): Daffy rabbit-naps Bugs to win a TV game show prize. This one’s an odd bird: Bugs gets top billing for a short that appears on a Daffy DVD. The two interact well to create good comedy, though. The results are less antic than I’d like, but this still becomes a quality short. 7/10. Person to Bunny (1960, Friz Freleng): We go to Bugs’ California estate for a TV interview, and Daffy tries to horn in on the action. Like “This Is a Life?”, “Person” is really a Bugs short, and Daffy might not even deserve second billing; Elmer Fudd gets a lot of screen time as well. That makes it an odd choice for a Daffy DVD, but the short itself works. It’s a strange but clever premise that results in more than a few laughs. 7/10. Daffy’s Inn Trouble (1961, Robert McKimson): Daffy opens his own Western hotel to show up Porky’s operation. That’s an interesting notion, but the execution seems lackluster. If anything, the short plays like a more verbal take on the Road Runner series, especially when Daffy more actively attempts to sabotage his rival. 5/10. The Iceman Ducketh (1964, Phil Monroe and Maurice Noble): Daffy wants to rake in the bucks that come with animal hides, so he tries to nail a rabbit – or a Bunny. That story essentially does little more than cast Daffy as Elmer Fudd. This seems like an odd choice, particularly because there’s something sort of creepy when we see animals hunting other animals; at least the human vs. critter dynamic of Elmer vs. Bugs seems more natural. Add to that another short with a general Road Runner vibe and “Ducketh” becomes mediocre. 5/10. Suppressed Duck (1965, Robert McKimson): Daffy goes bear hunting. 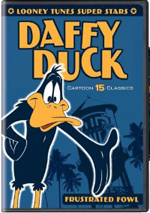 Seriously – when did Warner Bros. decide that Daffy should become the new Elmer Fudd? Maybe they decided Fudd had run his course but still had a lot of Elmer-related scripts on the shelf so they decided to use Daffy instead. “Daffy the Hunter” remains a peculiar theme, and this short lacks much inspiration. 4/10. Footnote of annoyance: the DVD starts with a disclaimer about some potentially offensive content. (“Wise Quackers” would appear to be the main reason for this.) I don’t object to the notice itself, but the fact it can’t be skipped and seems to remain onscreen forever make it a bigger irritation than necessary. Why can’t we just pass by this thing if desired? Is there some reason we must view this thing every time we launch the DVD? Looney Tunes Super Stars: Daffy Duck appears in an aspect ratio of 1.33:1 for its first five shorts; after that it goes to a 16X9 enhanced aspect ratio of 1.85:1 on this single-sided, double-layered disc. The shorts remained watched but replete with more than a few flaws. For the most part, sharpness looked fine. Occasional instances of softness interfered, and some digital artifacts complicated that issue, as those gave the image a bit of a messy look that degraded accuracy. Nonetheless, general accuracy remained positive. No concerns with jagged edges or shimmering materialized, but I detected some edge haloes in addition to the artifacts I mentioned. As was the case with the simultaneously released Bugs Bunny collection, print defects became the biggest distraction. Throughout the shorts, I noticed a mix of specks, marks, spots, and other blemishes often marred the image. These improved a bit as time progressed, but they remained problematic much of the time. Colors seemed passable but not much better, largely due to the artifacts and general dirtiness. Those elements ensured that potentially dynamic hues lost a lot of their luster. The tones were adequate most of the time but rarely vivid. Blacks seemed acceptable, and shadows showed fair smoothness and clarity. I still enjoyed the shorts, but they’d benefit from work to make them cleaner. As for the monaural audio, it seemed lackluster, especially during the oldest shorts. Those tended toward rather harsh, brittle audio. Speech could be edgy, and both music and effects came across as rough. That was only a significant issue for the first few cartoons, though. After that, the sound seemed acceptable though still average at best. The lines were reedy but intelligible, while music appeared decent; the scores and songs showed fair definition despite a lack of great range. Effects occasionally showed distortion, but they usually remained reasonably concise. The various flaws dropped my grade to “C-“, but I still felt the audio was usually passable for its age. The disc opens with ads for Scooby-Doo: Abracadabra-Doo and the Galactic Taz Ball video game. No other extras appear. He still plays second fiddle to Bugs Bunny, but as demonstrated here, Daffy Duck may be WB’s best cartoon character. 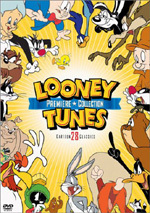 Looney Tunes Super Stars doesn’t include 15 stellar shorts, but most vary from good to great, and only a few relative duds appear; that’s a higher batting average than the related Bugs release enjoyed. Unfortunately, the presentation disappoints. Picture and sound suffer from flaws, and we get no supplements. The combination of funny shorts and low DVD price still means the set earns my recommendation, but it could’ve been better.